HP has developed an inertial accelerometer that's so sensitive, it can detect a change in the position of its center chip of less than one-billionth the width of a human hair. Hartwell's device is sensitive enough to "feel" a heartbeat. 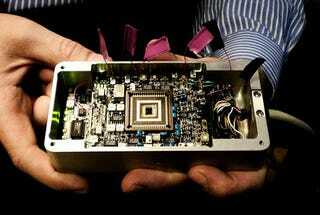 The source of that sensitivity is a 5mm-square, three-layer silicon chip. A portion of the center wafer is suspended between the two outer wafers by flexible silicon beams. When the chip moves, the suspended center lags behind due to its inertia. A measurement of that relative motion is used to calculate the speed, direction and distance the chip has moved.